Robert F. Kennedy Jr., flanked by state Reps. Jack Hennessy and Anne Dauphinais. 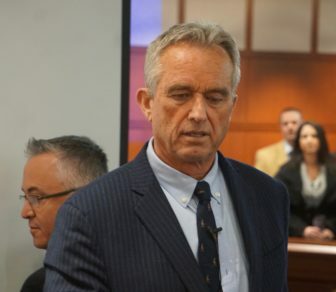 Robert F. Kennedy Jr.’s voice quavered Tuesday as he denounced the makers of childhood vaccines and the institutions he sees as their collaborators. It’s a long list. Among others, it includes the Centers for Disease Control, the World Health Organization, the Food and Drug Administration, the American Academy of Pediatrics, the Democratic Party and the media. Kennedy, 65, is the namesake of the slain U.S. senator, a member of a family sometimes viewed as American royalty, interviewed by Oprah and praised earlier in his career as an environmental crusader, the Riverkeeper who defended the Hudson. Now, he calls himself a heretic, a challenger of the medical, scientific and media establishment. He says childhood vaccines are unsafe, their makers criminal. The media won’t tell the story, because Big Pharma spends so much money on TV advertising that the press is cowed. He knows, he says, because Roger Ailes told him so. Kennedy was in Hartford on Tuesday for a debate that never happened. The other side — a pediatrician and four Yale scientists — had agreed to a roundtable talk about the science of vaccines, not a debate. The American Academy of Pediatrics, among others, says there is nothing to debate. Rep. Josh Elliott, D-Hamden, who has proposed eliminating the religious exemption that allow Connecticut parents to refuse vaccinations for their children, said some of the panel participants ultimately declined, urged by colleagues not to engage Kennedy. “They got emails from various doctors around the country saying, ‘Don’t legitimize him,’” Elliott said. Elliott said he disagreed, certain that science and facts would carry the discussion. So instead, Kennedy delivered a powerpoint presentation in a hearing room at the Legislative Office Building in Hartford, joined by a half-dozen sympathetic lawmakers and more than 100 parents, mainly mothers, who cheered him. At the midpoint, he took questions from reporters. Kennedy is a hero to a small, passionate cohort of parents who opt not to vaccinate their children, giving rise to the recent outbreak of measles, a disease largely eradicated in the U.S. after the introduction of a measles vaccine. Science is uniformly against them, but they have the web, each other and a few celebrities, including Kennedy. He is famous and quotable, his rhetoric flame-thrower hot: Every maker of the 72 vaccines recommended for U.S. children is a convicted felon, responsible for falsifying science and killing hundreds of thousands of people. His uncle was president, his father a senator, his brother and nephews congressman, his cousin a state senator in Connecticut — all Democrats. But he did not stint in his criticism of Democrats, whom he called too beholden to contributions from Big Pharma. His uneven voice is a consequence of spasmodic dysphonia, a rare disorder that affects his voice box, often making him sound on the verge of tears. His relatives have not joined his crusade. After raising his kids in New York, he lives in Los Angeles now with this third wife, the actress Cheryl Hines. Too many people, too many institutions accept the safety of vaccines on faith, he said. Kennedy, of course, did his own vilifying. He accused one former CDC executive of taking a bribe by joining the drug maker, Merck. The CDC and FDA are hopelessly corrupt in his view. He rejects any suggestion that his assaults on media and scientific institutions are from the same playbook employed by President Trump, who regularly delegitimizes the media as purveyors of “fake news,” the courts as corrupt, and the science behind climate change suspect, at best. Kennedy had announced after meeting with the president-elect in January 2017 that Trump would appoint him to lead a vaccine safety commission. Two years later, nothing has happened, and Kennedy rejects any suggestion of an alliance with Trump. “He is the worst president in history. He’s undermined 30 years of my work,” Kennedy said. He said he was referring to vaccines, but he is also at odds with Trump on climate change. On Tuesday, Kennedy was asked how he could reconcile his belief that Americans should accept and act on the scientific consensus that climate change is real, while urging them to reject the scientific consensus about the safety and efficacy of vaccines? Established science would be peer-reviewed studies, he said. But he also rejects many medical journals as parties to the groupthink. The New England Journal of Medicine published a Danish study in 2002 that found no difference in the incidence of autism among children who were vaccinated with a measles vaccine and those who weren’t. A new study published two weeks ago in the Annals of Internal Medicine, also based on Danish vaccination data, reached a similar conclusion. 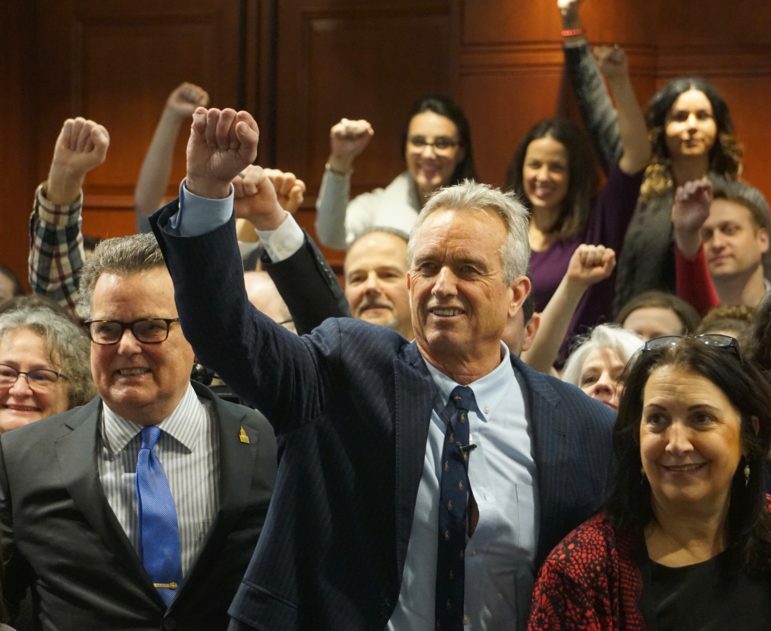 Kennedy was hosted by Reps. Jack Hennessy, D-Bridgeport, and Anne G. Dauphinais, R-Killingly, who both support preserving Connecticut’s religious exemption. Dauphinais agreed with Kennedy’s assertion that the defeat of many childhood illnesses in the U.S. were due to improvement in nutrition and environment. Congress passed the Clean Air Act in 1970 and Clean Water Act in 1972. Vaccines for polio and measles were introduced in the 1950s and 1960s. To bolster his case, he mentioned “Spotlight,” the film depicting the Boston Globe’s dogged investigation of abusive priests and the church’s coverup. The movie depicted a newspaper that was initially slow to understand the church’s role in the abuse, but ultimately defied all efforts by the church to quash the story and wound up winning the Pulitzer Prize for its reporting. Kennedy said he is opposed to unproven vaccines, not all vaccines. But he dodged when asked, based on a risk benefit analysis, if there were any vaccines he would recommend.